This week’s TWD recipe was Blueberry Sour Cream Ice Cream. The blueberry part sounded great, the sour cream part…not so much. The thought of sour cream in my ice cream kinda made me gag a little, so I looked to my good friend Em and allrecipes. Em and I decided to skip this week’s TWD recipe and instead do something along the same lines, but sans the sour cream. 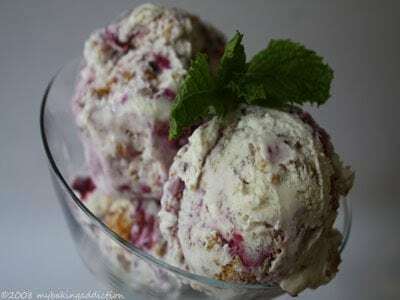 We located this scrumptious recipe for Blueberry Cheesecake Ice Cream and decided to go with it. The outcome was a delicious creamy cheesecake flavored ice cream with beautiful swirls of blueberries and yummy pieces of graham cracker crust. Check out Em’s blog by clicking here to see her strawberry cheesecake version. If ya want the real Dorie recipe check out Delores’ blog at Chronicles in Culinary Curiosity, if ya want the Dorie substitute from allrecipes, click here! Enjoy! Your ice cream looks gorgeous. What rebels we are hahahahaha! I absolutely love that you guys did this! It looks fantastic! the regular recipe tasted like cheesecake anyway – great idea! Oooh. I’ll have some of that! I love that you took inspiration from the “base” recipe and ran with it, making it your own. Great job. My DBF loves cheesecake ice cream, this will be right up his alley! This ice cream looks delicious and I would love to try some. Nice sub. OMG! What a great idea! Cheesecake ice cream sounds devine!!! Looking at this, I feel faint with longing! :) If only I had everything on hand, we might be eating this for dinner, about eleven o’clock tonight. Sigh. Wow, what an ice cream! I love all the additions!